Why carry liquefied petroleum gas (LPG) aboard your boat? Lots of boat owners manage without it, particularly those with generators that are capable of operating electric ranges and ovens. It’s difficult to deny that not having LPG aboard certainly is safer. Liquefied petroleum gas is, after all, highly explosive and can be ignited by an open flame or the smallest spark—even a spark generated by static electricity. Many cruisers prefer the way LP gas works, particularly where cooking appliances are concerned. It turns on and heats up almost immediately, the flame is easy to see, and when it’s off, you know it’s off. It’s no coincidence that nearly all professional chefs insist on cooking with a flame produced by gas. Perhaps most appealing of all, LPG-powered stoves are silent. Have you ever been sitting aboard your boat, enjoying the early morning serenity of a secluded cove, only to have it shattered by the putt, putt, putt, swoosh, aarrrmmmm of a generator your neighbor has started to make a pot of coffee? I have, and it’s not an event I wish to perpetrate upon my fellow cruisers. In bringing LPG on board, are we sacrificing safety for convenience? Perhaps, but that’s nothing new. Many of us use LPG in our homes and businesses, and most of us drive cars that carry numerous gallons of another highly flammable and explosive liquid: gasoline (the fuel from which LPG was discovered, by the way). If your boat or tender is gasoline powered, then the risks associated with a flammable liquid are present there, as well. During the combustion process, appliances that burn LPG or any other carbon-based fuel—including wood, charcoal, and all petroleum-based products—produce varying amounts of carbon monoxide (CO), a colorless and odorless yet highly toxic gas. Some fuels produce more CO than others. Gasoline, for example, produces large amounts of CO when burned, while diesel produces comparatively little. LPG falls somewhere in the middle, but under certain circumstances, it may generate excessive amounts of carbon monoxide. There are, however, a variety ways to eliminate or minimize the dangers inherent in LPG use, many of which will be detailed below. The American Boat & Yacht Council’s standards include a guideline titled “Marine Liquefied Petroleum Gas Systems,” designated as Chapter A-1. (As important as it is, this designation is perhaps no coincidence.) As a former marine mechanic and boatyard manager and now a marine systems technical consultant, I believe many boatbuilders and repair yards find this guideline to be among the most difficult and challenging with which to fully comply. The number of LP gas installation violations I see every year reinforces my thoughts on this subject. In my estimation, approximately 75 percent of the boats I inspect, both new and used, fail to comply with some portion of the guideline. In the text that follows, we’ll examine the most important sections of ABYC’s Chapter A-1, along with the most commonly violated tenets of the standard. LP gas was first discovered in 1910 as it was “evaporating” from the gasoline stored in the tank of a Ford Model T. Walter Snelling, a chemist and explosives expert for the U.S. Bureau of Mines, was called upon to investigate the phenomenon. After removing the gasoline from the vehicle’s tank and studying it, Snelling determined that its gaseous components consisted of propane, butane, and other hydrocarbons. He invented a way to separate these components, which liquefy under moderate pressure, and determined that this combination of colorless, odorless gases, dubbed “liquefied petroleum gas,” could be used for lighting, cooking, and metal cutting. Until the mid-1920s, LPG (often referred to as “propane,” since propane is its main component) was used primarily for cutting metal. It was not commonly used for cooking until the Tappan Stove Company began producing gas ranges in 1927. The first propane-powered refrigerators—yes, refrigerators can run on propane, with no electricity and no moving parts—were produced by the Servel company in 1928, and some operated continuously for more than 50 years. LPG refrigerators are still available from a small group of manufacturers, but they are not practical for boats because they must always remain level. Most propane fridges are used in remote locations where there is no electricity. To better understand proper operating procedures and potential safety concerns related to LP gas, it’s helpful to learn more about the properties of LPG itself. Let’s start by establishing what LP gas is not. LP gas is not the same as natural gas, street gas, or compressed natural gas (CNG). The gas that is supplied to your home from a utility company through underground pipes (hence the term “street gas”) is CNG. Gas that is used for appliances and is stored outside your home in metallic bottles, which may be replenished by a delivery truck, is LPG. The primary differences between natural gas and liquefied petroleum gas are the way they are stored, their specific gravity (essentially, how much they weigh), and their energy content. CNG does not liquefy easily. Thus, for household and marine use, it’s stored as a gas in cylinders that resemble scuba bottles under great pressure, approximately 2500psi. CNG is lighter than air, which means that it rises when it leaks. This is often considered a benefit, since it won’t accumulate in the bilge of a boat or in the basement of a home. However, if CNG leaks in a confined, relatively airtight space, such as a boat or house, explosive limits can be reached quickly; the gas becomes flammable at roughly 5 percent concentration. CNG possesses only about one-third the energy content of LPG, and it burns about 400° cooler. Therefore, the burners in appliances that use CNG are different from those used with LPG; you cannot interchange fuels without modifying the appliance. There are other differences between CNG and LPG, but those I’ve mentioned are among the most critical. While compressed natural gas gained a measure of popularity in the marine industry for a short time 15 or 20 years ago, it’s unlikely you will encounter a cruising vessel today equipped with CNG appliances. The storage bottles are heavy and cumbersome, and finding refilling stations is extremely difficult. LPG consists of hydrocarbons that are derived from petroleum during the refining or “cracking” of light crude oil. Some of these hydrocarbons also are removed from natural gas during the refining process. LPG possesses some unique characteristics that may require a little mind bending to comprehend. As a two-phase liquid/vapor fuel, it boils at minus 44°F under normal atmospheric pressure. When pressure increases, as it does when an LPG tank is filled, the boiling point also increases. (This is the same principle that works inside a pressure cooker; increased pressure raises the boiling point of a liquid.) At approximately 100°F and 180psi, LP gas becomes a liquid, which is why you can hear it sloshing around inside a partially filled tank. When an LPG tank is hooked up to an appliance and gas is drawn from the tank, the pressure of the vapor bubble trapped inside the top of the tank drops momentarily. (To allow room for the vapor bubble, LPG tanks should never be completely filled with liquid.) The drop in pressure allows a small amount of liquid to boil off. This re-equalizes the pressure of the vapor bubble, and the boiling ceases until more LPG is used. If the gas is used continuously, as it often is, a state of equilibrium is reached, and the vapor pressure inside the tank remains constant—between 177 and 250psi, depending on the ambient temperature—as the liquid boils. For this reason, a pressure gauge cannot be used to determine the quantity of fuel in an LPG tank; the pressure will remain more or less constant until the tank is all but empty. The most reliable method of determining the quantity of fuel inside an LPG tank is either by weight or by using a liquid-level gauge, if your LPG tank is equipped with such a device. The newer translucent fiberglass tanks allow you to directly see the fuel level. Unlike CNG, LP gas is about one and a half times heavier than air, which means it will settle invisibly into low areas when released from a tank or appliance. This is perhaps LP gas’s most dangerous feature, and it must be kept in mind whenever this fuel is brought aboard a boat. All but the smallest amounts of leaked gas will settle and accumulate in the bilges and in the bottoms of lockers and cabinets, particularly those whose bottoms are air/liquid tight. LPG is nontoxic, but in high concentrations, it will displace enough air to make breathing impossible for humans and animals. (Small animals with high metabolisms are particularly sensitive to poisonous or oxygen-displacing gases, hence the canary “gas detectors” that were once used in coal mines.) In its natural state, LP gas is odorless. To make leak detection easier, an odorant called ethanethiol has been added to all LP gas refined in the United States since the early 1930s. The distinctive odor of ethanethiol is now so familiar to most adults that it has doubtless saved thousands of lives. When it comes to cooking and heating, one of LPG’s greatest attributes is the intense heat of its flame: approximately 3,600°F. This characteristic, combined with the high speed at which the flame travels (2,800 feet per second), also makes LPG extremely explosive and destructive. Additionally, its flammability threshold is a scant 2.4–9.6 percent, which means it doesn’t take very much of it to sustain flame and/or an explosion. The temperature at which LPG ignites is between 920° and 1,120°F; any flame, spark, or glowing metal surface is easily that hot. There is a positive trade-off for all of LPG’s flammability, heat, and explosive capacity. It packs a lot of energy content into each gallon of liquid: approximately 91,500 Btu at 60°F. As a comparison, the energy content of compressed natural gas is about 35,000 Btu per gallon, and gasoline’s energy content is 125,000 Btu. High energy content is what makes that small cylinder of LPG seem to last so long aboard your boat or beneath your barbecue. LP gas tanks used aboard recreational vessels come in a seemingly bewildering variety of shapes, sizes, materials, and configurations. Traditionally, the two most popular materials are steel and aluminum, but Department of Transportation-approved fiberglass tanks also are available. At the time of this writing, at least one U.S. manufacturer was selling fiberglass LPG tanks (The Lite Cylinder Company; www.litecylinder.com). These tanks are virtually impervious to corrosion and rust, and they have the added benefit of being translucent, making for a built-in gas gauge of sorts, since you can easily see the level of the liquefied gas inside. For marine applications, steel LPG tanks are available in 4.25-, 11-, 14-, and 20-lb. varieties, while aluminum tanks come in 6-, 10-, and 20-lb. sizes. (Other sizes are available in both steel and aluminum for domestic and industrial applications.) Fiberglass tanks for recreational use are currently offered in 10- and 20-lb. capacities. 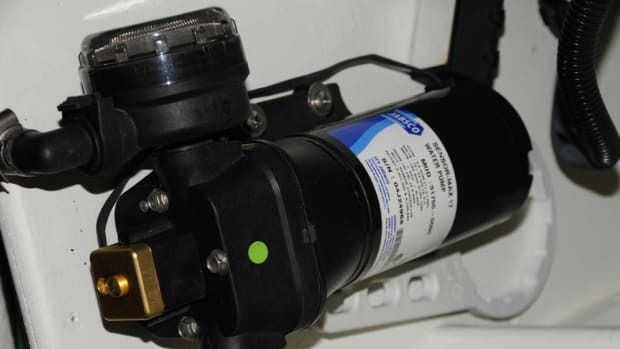 If you use LP gas aboard your boat, you’ve probably looked at the cylinder at one time or another and wondered what all of the letters and numbers stamped on the handle mean. It’s important to know the implications of at least some of these markings, from both a safety and a consumer point of view. “WCW” simply stands for water capacity weight—if you filled the cylinder with water, this is how much it would weigh. Since LP gas weighs about four-tenths what water weighs, determining the LPG capacity of a cylinder requires just a little arithmetic (multiply the WCW by 0.42). One of the most common LP gas cylinder sizes, 20 lb., has a WCW designation of 48. “TW” refers to the tare weight, which is nothing more than the weight of the empty tank. If you weigh your LP gas cylinder, anything over the tare weight is “cargo content” or LP gas. “DOT” stands for Department of Transportation; if these letters are stamped on the tank, then it met all of the specifications for LPG tank construction at the time it was manufactured. The U.S. Department of Transportation has jurisdiction over all portable LPG tanks—those that might be transported over the nation’s highways—up to 100 lb. in capacity. Perhaps the most important figure of all that you’ll find on your tank is the date code. This tells you the date on which the cylinder was manufactured in month-year format, such as “8-99” or “12-06.” DOT regulations require that the cylinder be “re-qualified” within 12 years of this date, which entails undergoing either a hydrostatic test or a visual inspection by a qualified LPG service facility. If the tank is hydrostatically tested, it will be stamped with a new date, renewing its 12-year inspection interval. If a visual inspection is performed, the new inspection interval will be five years, rather than 12 years, and this will be indicated by a letter “E” being stamped after the expired manufacture date. If you have an LPG tank that is severely rusted, corroded, or otherwise damaged, it will not pass the recertification test. Since October 1998, every new portable LPG cylinder with a capacity between 4 and 40 lb. has been manufactured with an overfilling prevention device (OPD). This device prevents the tank from being filled with too much liquid. A vapor space of approximately 20 percent should always remain at the top of the tank, even when it is filled to capacity. Tanks that are overfilled leave no room for expansion of the liquid when the ambient temperature increases—for instance, if you have the tank filled on a cool morning and then take it to your boat and leave it in the sun or in a hot storage locker. When this occurs, the tank may vent gas or liquid through its pressure-relief valve, or liquid propane may flow to appliances, causing excessive pressure and possible fire or explosion. According to a regulation that went into effect on April 1, 2002, any LPG tank that is refilled must have an OPD. (Portable horizontal tanks manufactured before 1998 are exempt from this law.) This is probably old news to most cruisers. It’s not readily known, however, that several other safety measures took effect with the OPD ordinance. In addition to preventing overfilling, the OPD valves incorporate a positive seal mechanism that prevents gas from flowing unless a hose is attached. Unlike the old-style valves, OPDs will not allow gas to escape unless a hose is attached, even if the tank is full and the valve is opened. However, leaks may still occur at the interface between the valve and the hose connection if the fitting is not properly tightened. This has happened to me, and it is precisely why proper gas lockers are so important (more on those below). In addition, the new valves utilize an external, right-hand Acme thread, as opposed to the old valves’ internal, left-hand POL thread, which is turned counterclockwise to tighten. This makes the OPD valve easier to use and requires no tools, and it works with plastic couplings that are designed to melt and shut off the flow of gas in the event of a fire. Finally, OPD valves are equipped with an excess flow feature that prevents gas from flowing out of the cylinder in the event of a catastrophic break in a supply hose or pipe. If the LPG supply line were to be completely severed by a 40-lb. anchor dropping on it, or if the rubber hose were to melt during a fire, the OPD valve would sense the greatly increased flow of gas and would stop it almost immediately. If the ABYC’s LP gas standard is especially difficult for boatbuilders and yards to comply with, the storage locker provision within this guideline is even more challenging. The guideline leaves little room for variation or creativity, and rightfully so. When you’re dealing with an invisible, explosive gas, the standards must be clear and exacting. Although it seems self-evident, it’s worth stating that the locker in which LP gas tanks are stored must be vapor tight so that gas won’t leak out of the locker or into the hull. When closed, the locker can have no cracks, holes, seams, or gaps of any kind, no matter how small. Purpose-made, off-the-shelf lockers often are made of a single piece of fiberglass or roto-molded plastic, which eliminates joints and seams, making it easier to meet this standard. Lockers that are an integral part of the boat’s structure—under a settee or within the coaming, for instance—are more apt to run afoul of this requirement because they usually are constructed from multiple components. 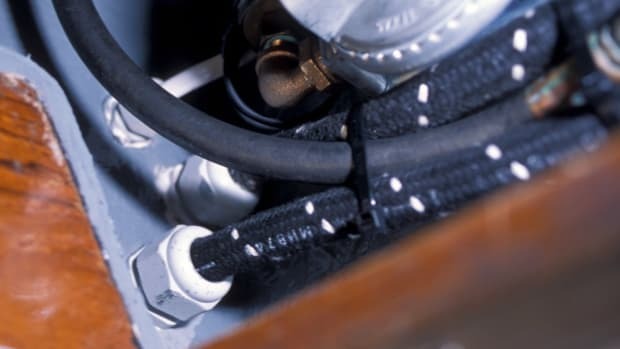 A gastight seal must be made at every location where wires (for electric solenoid valves), copper tubing, or hose passes through the wall of a locker. This may be accomplished by using a compression-type gland fitting or a careful but liberal application of flexible sealant or caulk. Each locker must be vented at its lowest point using plumbing with a minimum inside diameter of 0.5 inch; the plumbing must travel overboard, moving continuously downward from the locker base without dips, rises, or loops. (If water enters the vent, none must be trapped.) The overboard outlet for the vent must be above the static waterline and at least 20 inches from any other breaches or openings to the hull’s interior. The locker’s lid must open from the top, must lie horizontally when closed (a point where many installations fail), and must be fully gasketed and latching. No tools should be required to gain access to the inside of the locker. Although it’s not an outright requirement, it is recommended that the locker be located on deck so that the lid opens directly to outside air. If the locker is located inside the boat—in a lazarette, for instance—then the locker’s lid must be as close as possible to the nearest hatch opening and still must be horizontal when shut. It comes as a surprise to many cruisers who use liquefied petroleum gas that the ABYC guidelines on the subject of tank storage also apply to tanks that are not in use. Tanks that are not plumbed to the vessel’s LPG system must be stored in the same manner as tanks that are active. Thus, your boat’s LPG storage locker must be large enough to accommodate all of the tanks you will carry at any given time, including spares and even those that are empty (“empty” tanks often retain some LP gas). If multiple tanks can be connected to the LPG system simultaneously, a manual shutoff valve or automatic check valve must be located between the tanks so that gas cannot flow out of one cylinder and into another, or out of a disconnected hose (multi-tank valves made for this purpose are readily available). Special attention must be paid to hoses used for LPG barbecues. When disconnected, gas should not be able to flow from the hose. This can be achieved by using a built-in needle valve that will only allow gas to flow when the hose is connected to the appliance. In addition, an LPG locker should never be used for storage of any non-LPG-related gear. Lastly, it should be noted that if you don’t mind sacrificing aesthetics, the above provisions often can be met by tanks that are stored on deck—and not in a locker—provided they are at least 20 inches from any opening to the boat’s interior and that the tanks and their associated plumbing, regulators, and valves are protected from the elements. Liquefied petroleum gas offers many conveniences for boat owners. By carefully following the proper installation, handling, and storage procedures, cruisers can take advantage of the benefits of LPG without forfeiting safety or peace of mind. In Part II of this series on LP gas systems, we’ll look at plumbing, system installation, gas detection, and additional safety issues. Steve owns and operates Steve D’Antonio Marine Consulting (www.stevedmarineconsulting.com), providing consulting services to boat buyers, boat owners, and the marine industry.